(Nanowerk News) In the quest for renewable fuels, scientists are taking lessons from a humble bacterium that fills our oceans and covers moist surfaces the world over. While the organism captures light to make food in a process called photosynthesis, scientists have found that it simultaneously uses the energy from that captured light to produce hydrogen. The latest finding, published in Scientific Reports ("Multi-Omic Dynamics Associate Oxygenic Photosynthesis with Nitrogenase-Mediated H2 Production in Cyanothece sp. ATCC 51142"), concerns a cyanobacterium known as Cyanothece 51142, a type of bacteria also called blue-green algae that produces hydrogen — a resource that is one focus of the worldwide push toward renewable energy. 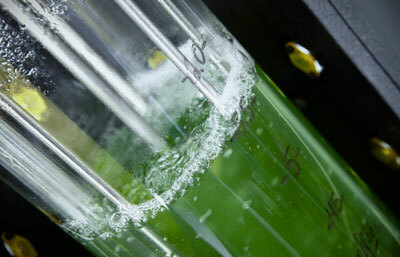 In a paper published in 2012 in mBio ("Sustained H2 Production Driven by Photosynthetic Water Splitting in a Unicellular Cyanobacterium"), Beliaev and colleagues raised questions about how the microbe drew upon the energy required to produce hydrogen. In the new paper, the molecular signals the team studied show that photosynthesis and the hydrogen production by nitrogenase happen hand in hand in a coordinated manner.